Why Choose Information Technology Management? Businesses, nonprofits, and government agencies are increasingly relying on data to drive decision-making, increase productivity and profitability. Every action we take, from donating blood to buying groceries, is recorded and analyzed to better serve you. Graduates who can make sound decisions when choosing, implementing and using these systems are in high demand locally, nationally, and globally. 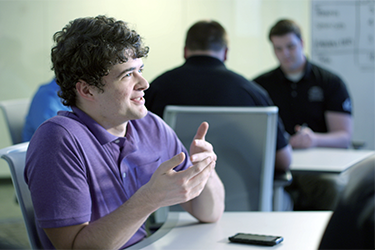 If you are curious, passionate about innovation, and like solving problems, a certificate in information technology management will enhance your existing experience, help you achieve your goals, and advance your career. The field of information systems management is continuing to grow as demand for professionals who can implement and upgrade business systems are vital to the economy. This certificate prepares you for careers that require knowledge in systems analysis, business systems designs, and information technology management. Most of our graduates find better career opportunities in their current organization or at external companies. Classes are focused on experiential learning, allowing students to apply concepts learned in class to real-world situations. View Information Technology Management Certificate program information and degree requirements in the University Catalog. A minimum undergraduate GPA of 2.7 on a 4.0 scale or a graduate GPA or 3.0 on a 4.0 scale. There are no math or statistics prerequisities for this certificate program. Applicants whose native language is not English are required to have a minimum score of 79/120 (IBT) on the Test of English as a Foreign Language (TOEFL) or a band 6 through the International English Language Testing System (IELTS). In this program, you will pick three courses on business analytics, business system design, computer programming, project managment, information technology management, or other information technology-related course. Each course requires a one-day residency on campus and five weeks of online learning, with flexible scheduling options. To graduate, you must earn a grade of ‘B’ or better for all courses, with only one ‘C’ allowed, and finish with an overall GPA of 3.0.